Please check our Phone Directory for the full data on AIRLINES. Moscow has several air terminals, each servicing various domestic and international locations. The main airports are Sheremetyevo ("SVO" - located northwest of the city center) and Domodedovo ("DME" - located due South of the city). 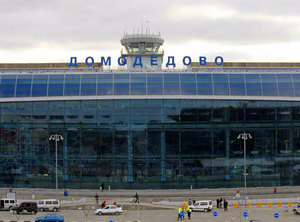 Domodedovo was entirely rebuilt in an ongoing programme that began in the late 1990s. Scheremetyevo's reputation fell considerably behind, but recent extensive developments have redressed the balance substantially. There is a third airport, Vnukovo, serving some domestic destinations. Domodedovo is a large, single-terminal airport, allowing easy transfers between flights and airlines. Scheremetyevo is a multi-terminal airport. 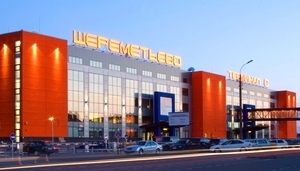 In Spring 2010 new terminals opened at Scheremetevo and the previous "numbering" of the terminals was replaced by a new letter-based naming scheme. The main international terminal is now Scheremetyevo-F (previously known as Scheremetyevo-2 - a name many taxi-drivers may still use). The other terminals (B, C, & D) are now so extensively newly-built or rebuilt, and their usage reallocated that it is no longer useful to refer to previous names. Terminals A and E will be opened in the future. Intense traffic-jams during weekday rush-hours (8-11 am, 5-8:30 pm) have made sidestepping road transportation a priority for many travellers. High-speed "AeroExpress" rail services now link both SVO (to/from Belorussky Station) and DME (to/from Paveletsky Station) airports to the centre. The timetables can be accessed here for Domodedovo, here for Scheremetyevo, and here for Vnukovo. Note that the Aeroexpress Train to Scheremetyevo Airport currently only runs to Terminal F - free shuttle-buses operate from Terminal F to other terminals (less frequently than perhaps desirable, and not very well signposted). Some domestic airlines (but not international services) offer check-in at the City AeroExpress terminal, subject to checking-in from 2-3 hours before the flight. Availability of this service, and mandatory minimum check-in times vary between airlines - you should check with your airline if you plan to use the (free) service. The one-way AeroExpress fare to either airport is 300 roubles (adults) and 80 roubles (children). A "Business Class" wagon (costing 750 roubles one-way for adults and 380 roubles for children) is available on Scheremetyevo trains only (offering more comfort, space, newspapers and free wifi). There is also an AeroExpress service to Vnukovo Airport (from Kievsky Station). The dedicated penny-pincher who prioritises cost above time/comfort can opt to travel on more basic public transport. To/from Scheremetyevo-F, take the Green metro line to Rechnoi Vokzal (the most northerly station), and then take the Public Bus 850-C (non-stop) to the airport. (Beware of traffic jams in peak periods). You can also take Bus 850, but it stops at every stop along the way. Be ready for jam-packed conditions on board. To Domodedovo you can take the same green line to the southernmost station Domodedovskaya, and from there take the Marshrutka (shuttle minibus service) marked for the airport. There are many private cabs and taxi companies who could also take you to the airport, for varying fares depending on time of day, market conditions, and type of car. Cheapest fares are approx 900 roubles (for a battered Lada, ordered by phone in advance) to 2500+ roubles for a luxury car. They still cannot beat the traffic jams however, and you may find yourself chewing your nails while sitting in traffic. The optimum compromise could be a taxi to/from the AeroExpress station, and then high-speed train onwards. Moscow has no airport heli-services currently. There is a peculiarity (a soviet-era throwback) at Scheremetyevo-F in that the order of check-in procedures is different to what you may be used to at home. First you clear Customs, then you go to a Check-In Desk, and then Passports - Security is checked at the Gate, so allow time for it. At Domodedovo things happen in the more conventional order - Check-In, Customs, Passports, Security. Whether you like it or not, Russia uses full-body scanners in its Security procedures - you are not permitted to decline. 1) Your baggage limit is strictly imposed at 20kg and there is no discretionary limit. You will be charged Excess Baggage for even 1kg above your limit, and this will be collected in the most bureaucratic, time consuming way imaginable. It is strongly suggested that you try not to travel with more than your baggage limit if you want to avoid wasting time and_money. 2) Some domestic flights still have Unreserved Seating, which often results in pushing-and-shoving battles to get onto the plane first. You may have to participate in order to get your chosen seat. 3) You MUST KEEP YOUR BAGGAGE RECEIPT. You will only be allowed to reclaim your checked baggage in your destination if you can show the baggage receipt (usually printed on a piece of card) that you were given at Check-In. 4) Most domestic flights are non-smoking. Very few have any entertainment (music, film etc) during the flight- even on very long trips. It's wise to bring your own book, CD player, etc. 5) Many flights to distant or less-visited destinations now operate as "hub-and-spoke" from Moscow - you will change planes in another city en-route, very often Novosibirsk (Sibir' Airlines) or Krasnoyarsk. Your baggage must be reclaimed and re-checked at the transit airport, as it will not be tagged through to your end-destination. Some airline staff participate in a scam to overcharge you on baggage, by claiming that your checked baggage allowance is 15kg inclusive of your carry-on bag. This is an on-going problem that seems to operate with the collusion of the airline's management (particularly at Krasnoyarsk airport), and there is almost no way to avoid it, although a VERY severe argument and a lot of shouting has been known to work. In fact throughout Russia's provincial airports foreigners are seen as an "easy target" for over-charging on fake accusations of "excess" baggage, and you should assume that they will attempt to over-charge you, so prepare for this situation. 6) Forget any notion you had that you are a "customer". On Russian domestic flights, passengers - along with their views and their custom - are seen as slightly less important than hunks of meat, and are treated very much the same way, despite the high price charged for tickets. 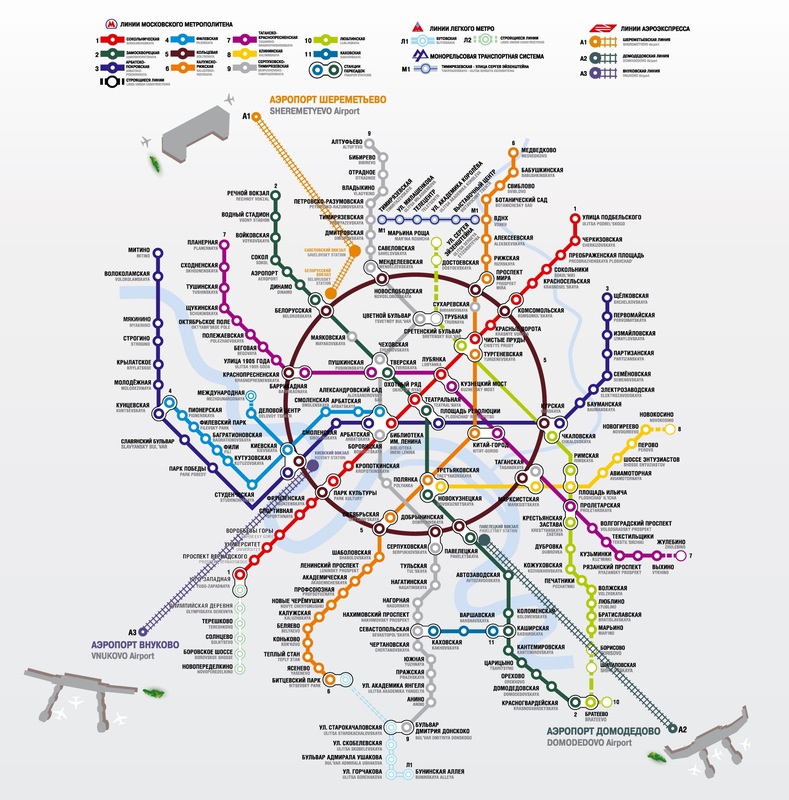 Listed below are the main air terminals located in Moscow, along with the telephone numbers of their respective information desks and public transportation routes to each terminal. Tel: 933-6666, arrivals and departures can also be checked online at www.domodedovo.ru Today, Domodedovo works with 80 partner airlines, including 30 Russian, 35 foreign and 15 air carriers from the CIS countries, which fly to 220 destinations in Russia and world-wide. Moscow Domodedovo Airport is easily accessible at any time of the day. The airport complex is connected with the capital by a modern speedway which enables our passengers to catch their flights on time using public transportation or taxi, as well as their personal vehicles. The airport offers a network of convenient parking areas. Moscow Domodedovo Airport operates an additional passenger terminal located in downtown Moscow, in the Paveletsky Railway Station building. The terminal is connected with the airport by a regular railway service - Aeroexpress. Paveletsky railway station has a city passenger terminal connected to Domodedovo airport by high-speed railway. 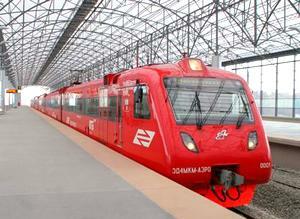 The comfortable high-speed Aeroexpress train travels to and from Paveletsky-Moscow and Domodedovo Airport. Time of journey: 40-50 minutes. Fare: 300 Rbs (adult), 80 Rbs (children). Departure from Paveletsky railway station hourly from 06:00 untill 23:40. Departure from Domedovo hourly from 07:00 untill 00:40. This train goes from Moscow, Paveletsky station to Domodedovo airport and from the airport to Moscow, Paveletsky station, with all stops en route. Time of journey: 1 hour 10 minutes. Fare: 92 Rbs. Special rate tickets: 46 Rbs. Children: 22,9 Rbs. Modern Scania, Man, Mercedes buses go non-stop to Domodedovo airport from Domodedovskaya underground station. Timetable: from 06:00 to 00:00. Time of journey: 25-30 minutes. Departure time: every 15 minutes. Fare: 80 Rbs. Children under 7 go free of charge. Luggage carriage is free of charge. 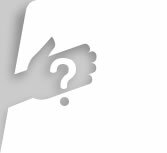 Ticketing: one may acquire a bus ticket in the passenger terminal, near the 0 (zero) counter at the domestic arrivals area. Bus stops: 1) Domodedovo airport - at the airport landside area between the entrances 2 and 3; 2) Domodedovskaya metro station - get off the last carriage of the train (if you go from the city centre), turn right in the pedestrian subway. The bus stop is close to the subway exit. Mini buses go from Domodedovskaya underground station to the airport round the clock. Timetable: from 06:00 to 00:00. Time of journey: 25-30 minutes. Departure time: every 15 minutes. Nighttime schedule (from 00:00 to 06:00): 00-00; 00-40; 01-20; 02-00; 02-40; 03-20; 04-00; 04-40; 05-20; 06-00. In case of non-observance of the departure time, call, 8-800-200-33-66 (24 hours a day). The main road leading to the airport from Moscow is Kashirskoe shosse, which flows into the airport junction road (Domodedovo Airport road). Both paid and free parking lots are available at Domodedovo International Airport. At paid parking lots 15 minutes period from the moment of arrival is free of charge. Some airlines offer check-in for your flight directly at Paveletsky railway station: Sibir, Domodedovo Airlines, TransAero. For passengers flying British Airways, there are two counters for self-service check-in at the airport. If you are late for checking-in, proceed to the late passengers check-in counter. Tel: 232-6565, arrivals and departures can also be checked online at www.svo.aero The main destinations of the domestic flights are Akmola, Alma Ata, Archangelsk, Baku, Irkutsk, Kaliningrad, Khabarovsk, Kiev, Kishinev, Krasnoyarsk, Magadan, Minsk, Murmansk, Nizhnevartovsk, Novosibirsk, Odessa, Omsk, Rostov-na-Donu, Samara, St. Petersburg, Tashkent, Vladivostok, Volgograd, Voronezh, Yakutsk, Yekaterinburg, Yuzhno-Sakhalinsk. The main destinations of the international flights are Great Britain, Germany, France, Italy, Spain, Turkey. 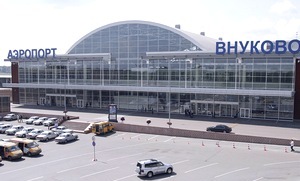 On 28 August, 2009, direct railway communication was opened between the Belorussky Railway Station and the Sheremetyevo International Airport. On their way to Sheremetyevo trains make a stop at the Savelovsky Railway Station. Trains going in the opposite direction do not make such a stop. In trains to "Sheremetevo" the passengers may use new business class coaches. They are offered reserved seat with an extra space, free newspapers, hot drinks, refreshments, as well as wireless Internet access. The fare is 750 Rbs (adult), 380 Rbs (children). Departure from Belorussky railway station from 05:30 untill 23:30. Departure from Sheremetyevo from 05:00 untill 23:00. Time of Journey: 35 minutes. Fare : 300 Rbs (adult), 80 Rbs (children). Departure from Savyolovsky railway station from 05:30 untill 23:30. Time of Journey: 30 minutes. Fare: 250 Rbs. Registration only takes place in the Belorussky railway station. From Rechnoi Vokzal: Bus 851C (express)- from 6:30 to 20:30 each 20 minutes. Time of Journey: 30–40 minutes. Fare: 25 Rbs. Bus 851 - from 5:35 to 0:49 each 9–30 minutes. Time of Journey: 40–50 minutes. Fare: 25 Rbs. Shuttle buses 48 and 200M - from 6:45 to 21:45. Time of Journey: 30–40 minutes. Fare: 60 Rbs. From Planernaya: Bus 817 from 5:30 to 0:08 each 15–30 minutes. Time of Journey: 40–50 minutes. Fare: 25 Rbs. Shuttle bus 49M - from 6:45 to 21:45. Time of Journey: 30–60 minutes. Fare: 60 Rbs. Travel duration is approximate disregarding traffic jams. Sheremetyevo International Airport is situated 28 km to the north-west of the downtown Moscow and at a 11 km distance from the Moscow Ring Road. To see a detailed map press here. Several paid parking lots are available. Tel: 937-5555, arrivals and departures can also be checked online at www.vnukovo.ru. Vnukovo International Airport offers its passengers all the comfort and conveniences of its two passenger terminals. Terminal B serves international arrivals and departures whereas Terminal D handles all domestic passenger traffic. Main destinations: (Russia and CIS): Georgia, North Caucasus, Ukraine, Eastern Russia. he Airport’s two passenger terminals offer a total capacity of 6800 pax. per hour with about 120 thousand flights by more than two hundred airlines from all over Russia, the CIS, and beyond, handled at the Airport every year. From Metro Kievskaya (exit to Kievsky Train Station). Once out on the Train Station forecourt, round the corner of the Station terminal building and a few yards down its front on your left-hand side you will see the entrance portico of the Vnukovo Aeroexpress Terminal. From here you can catch one of the high-speed trains that ply between Moscow and the Airport. Departure from Kievsky railway station hourly from 07:00 untill 24:00. Departure from Vnukovo hourly from 07:00 untill 24:00. One-way fares are as follows: adult 300 Rbs, child (5 to 7 years of age) - 80 Rbs, children under 5 y.o. - no charge, monthly pass - 5000 Rbs; bimonthly - 8750 Rbs; quarterly - 11250 Rbs. From Yugo-Zapadnaya: Bus 611 or 611C (express) bus. Your stop is Airport Vnukovo. Fare: 20 Rbs (if bought from a ticket booth), 25 Rbs (if bought from the bus driver). Time of Journey: 25-35 minutes. Buses run every 10 minutes. Taxi vans (route 45). Comfortable Ford vans. Fare: 100 Rbs. Time of Journey: 15-20 minutes. From Metro Oktyabr'skaya (circle line). Taxi vans (route 705M). Comfortable Ford vans. Fare: 130 Rbs. Time of Journey: 35-40 minutes. There are taxicabs plying between the Airport and the city 24/7. To avoid any incidence of overcharging and guarantee yourself a safe trip, book it with Vnukovo International’s resident taxicab service providers Trans-Free Cabs. Motorists have any of three major highway routes to choose when travelling to or from the Airport, the most popular one is via Kievskoe shosse. Both Minskoe and Borovskoe shosse also serve as convenient access routes. Once at the Airport, you will find plenty of both short- and long-term public parking space and options.